Came across a You Must Obey sticker on a sign on the Yellow Trail at Sunny Valley, yeah, obey the climb! This is where I should have trained for the Domnarski Farm race. 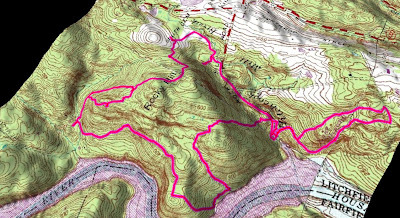 This route that I took climbs a total of 2000 feet over 7 miles. I think just looking at the map tells you it is a climb fest. Also on the yellow trail is a nice balanced rock from glacial times. Lots of slick rock and rollers all over the place on this ridge. The trail down to the You Must Obey sticker is a serious descent and thus serious hike-a-bike if you were going the other way - no thanks. Stupid hikers and their fall line trails. Well, there is a some dual track (old cart road) that the yellow trail follows for a bit which connects back into the trail further up the mountain. If I were to climb this section that is route I would take. Nice lookout where the Yellow and White Trails intersect. You can see Brookfield and New York off in the distance. The red trail descends all the way down to Lake Lillinohnah and what comes down must climb again. Looks may be deceiving. This section of the trail skirts a cliff over a stream that is 30+ feet below. The profile says it all. Lots of descending and lots of climbing. Thinking about coming back with a 21 or 22t and see how that works out.